If you're claiming JSA, ‘Actively seeking work’ does not mean doing every action listed in your Claimant Commitment each week: it means taking at least three steps. Many different actions may be listed on your Jobseeker’s Allowance (JSA) Claimant Commitment (also sometimes called a Jobseeker’s Agreement), but you are 'actively seeking work' as long as you do three or more of them each week. 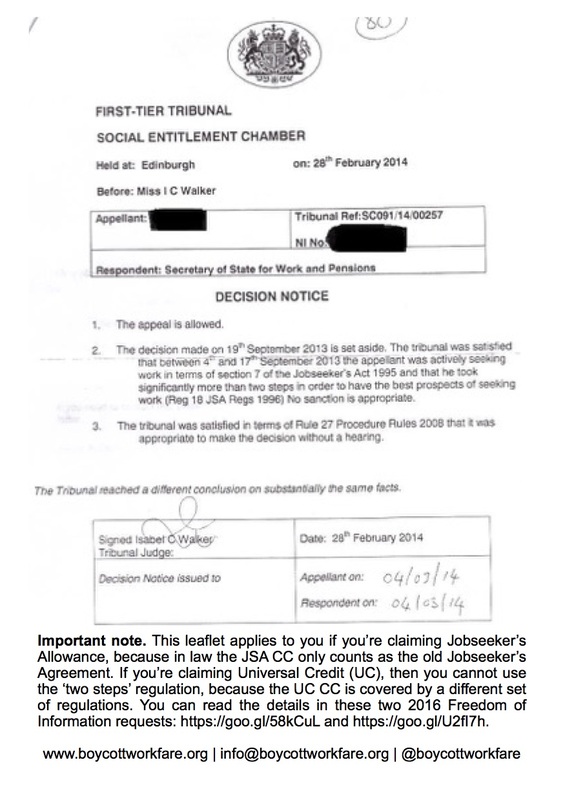 This information applies to you if you’re claiming Jobseeker’s Allowance, because in law the JSA Claimant Commitment only counts as the old Jobseeker’s Agreement. If you’re claiming Universal Credit (UC), then you cannot use the ‘two steps’ regulation, because the UC Claimant Commitment is covered by a different set of regulations. You can read the details in these 2016 Freedom of Information requests, here and here. If your Claimant Commitment (CC) lists more than three separate things you have to do each week, then you should not be sanctioned for ‘not actively seeking work’ just because you haven’t done all of these actions in a particular week. ‘Actively seeking work’ does not mean doing every action listed in your CC each week: it means taking at least three steps. appeal a sanction for ‘not actively seeking employment’. A ‘step’ could be: completing a job application, visiting an employer, amending a CV, or attending a job fair. These might be broken down into smaller steps. But it is probably safer to do three or more larger steps, to be sure you won’t be sanctioned: what counts as a ‘step’ has never been exactly defined. It is also important to record evidence for each step you complete, so that you can challenge or prevent a sanction. 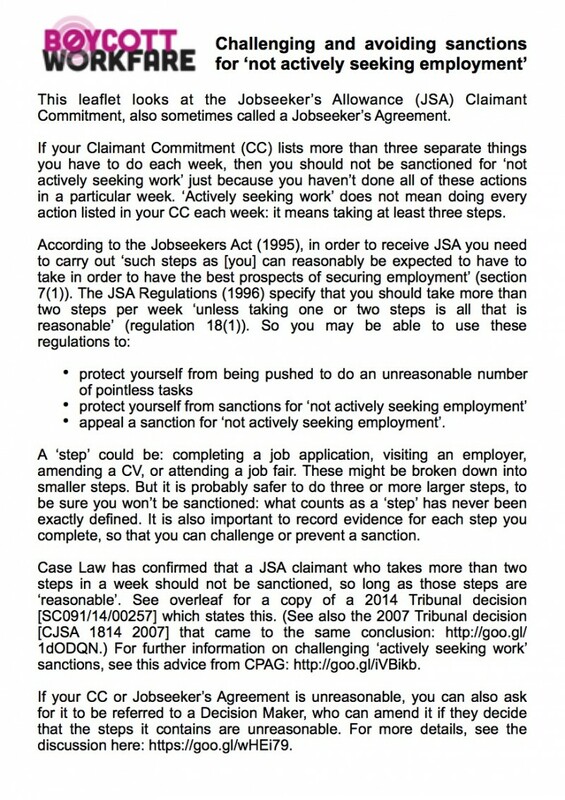 Case Law has confirmed that a JSA claimant who takes more than two steps in a week should not be sanctioned, so long as those steps are ‘reasonable’. See overleaf for a copy of a 2014 Tribunal decision [SC091/14/00257] which states this. (See also the 2007 Tribunal decision [CJSA 1814 2007] that came to the same conclusion) For further information on challenging ‘actively seeking work’ sanctions, see this advice from Child Poverty Action Group. Unreasonable Claimant Commitment or Jobseeker's Agreement? If your CC or Jobseeker’s Agreement is unreasonable, you can also ask for it to be referred to a Decision Maker, who can amend it if they decide that the steps it contains are unreasonable. For more details, see the discussion here.